The Anarchists had the most radical position in the socialist camp, favoring the destruction of the state, nationalization of land and industry, ending the war, etc. Neither in Russia as a whole nor in Petrograd was there a unified or well-known Anarchist organization; in the best case they came together in a federation. Separate groups or actors among the Anarchists played a major role in the political events of the Revolution; they were a part of the Soviets; they participated in the Bolsheviks’ Red Guard; and they formed their own armed brigades, the Black Guard. The Anarchists were one of the organizers of the July 3-5 protests in Petrograd and joined the Military-Revolutionary Committee of the Petrograd Soviet during the October coup. On many questions they were closely in league with the Bolsheviks. 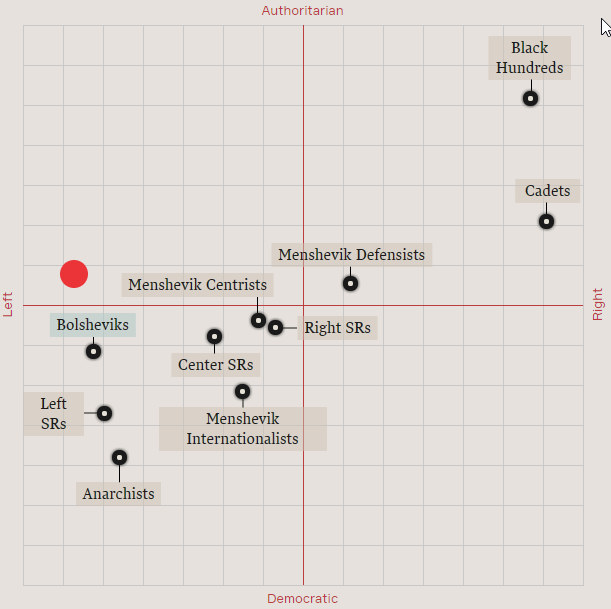 The Anarchists split amongst themselves on the question of relations with the Bolsheviks. Some of their leaders (Nestor Makhno, Vsevolod Volin and others) organized an armed struggle against both the Whites and the Reds. 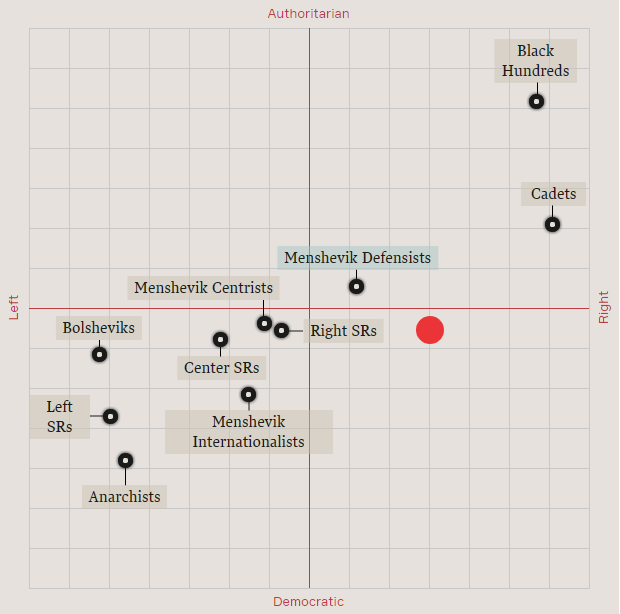 Rightwing of the socialist revolutionary party, funny position. I'm learning a lot with those charts. Arzamas is a good organisation. took the test yesterday and didn't take a picture of it, but iirc it was the same square as TG. I will never let a compass tell me where my adventure lies. The Menshivik Defensists occupied the right wing of the party, and for the most part supported the actions of the Provisional Government. Until February, they uttered slogans in support of the Fatherland (in contrast with the ‘Revolutionary Defensists’). The social-democratic group Unity (Edinstvo), led by Georgy Plekhanov, came out in favor of ‘war to its successful conclusion.’ The Defensists did not enjoy support among the masses, or among the Mensheviks. Funy thing is, I would rather fight for the White Army. 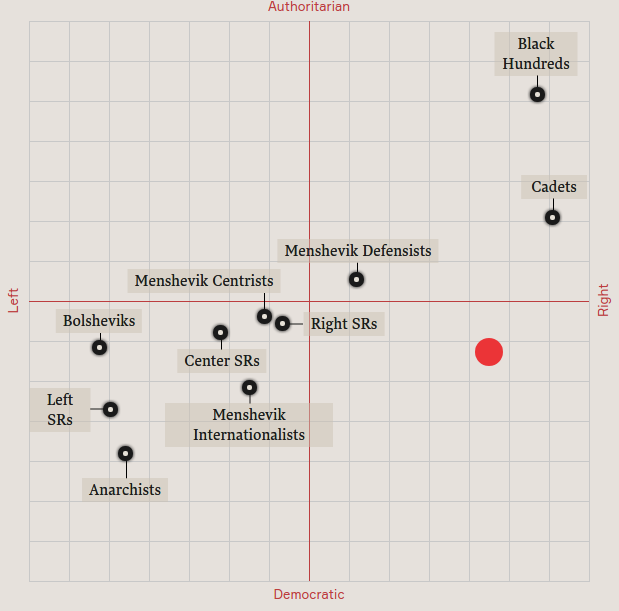 Huh, guess I'm not a tankie, then. Cadet - but honestly none of these positions describe me. I assume abolishing the Monarchy was already decided at this point, since Monarchy isn't an option. I would have supported Tsar Nicholas II, every other option is peasant-tier materialism.